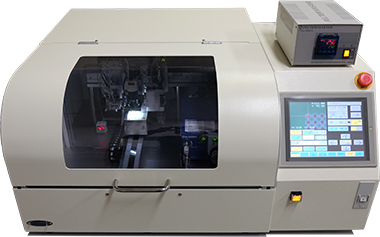 JISSO PROTEC 2018 | SHINAPEX CO., LTD.
for prototyping, R&D, and repair(re-balling) of BGA type IC packages and substrates. New STM-II is capable of ball placement with BGA coordinates data uploaded from PC via Ethernet. Thus, complex BGA pattern with different ball pitches is also available. The unique single solder ball separation unit enable to place solder ball on a BGA whatever the placement pattern will be. The new digital controlled flux dispenser and flux temperature controller ensure consistent and accurate flux application.